I dedicate the title of this post to SJ my running buddy! Last Saturday I ran my first trail run with the Sydney Striders 6ft training group. It was an early start as I had to be at Mosman for 7.00am and the drive would take me 45 mins to get there (plus I was a little worried I’d get lost, even with a GPS), so I left my place at 6.00am. When I got there it was pouring with rain, just like it had been for the past day or two. But us serious runners never let that kind of thing dampen our spirits or stop us from training. I sat in the car for a little while waiting for others to arrive and secretly praying for the rain to stop. We eventually got out of our cars and I introduced myself to the team and they seemed like a very friendly bunch. I got some brief advise from Pete and changed into my new Nike Zoom Wild Horse trail shoes as apparently my normal sneakers would be too slippery, and then we set off onto the trail. I was told it would be a part walkway and part trail kind of course, so probably a good way to start for someone who was new to this type of run. And it was awesome! We ran up and down rock stairs, over boardwalks, through puddles and streams, and we even shared part of the track with a bush turkey who showed us the way. It was truly an awesome run and I haven’t even mentioned the views yet. They were magical. We ran along the coastline for and when we got to the turnaround point we had views of both north and south head from an old gunners barracks. We also ran past old cottages that are now heritage listed and it truly was a beautiful part of the world. Unfortunately I didn’t take my phone with me so I have no photos but next time i’m up there I won’t be making that mistake again. I think that’s one of the main reasons i’m attracted to trail running, the views and the different locations and the variety of landscape. It’s an adventure even more so than a road race and after Saturdays run I know it’s going to be a very tough training program from now until the 6ft track trail marathon. A challenge I accept and look forward to conquering! 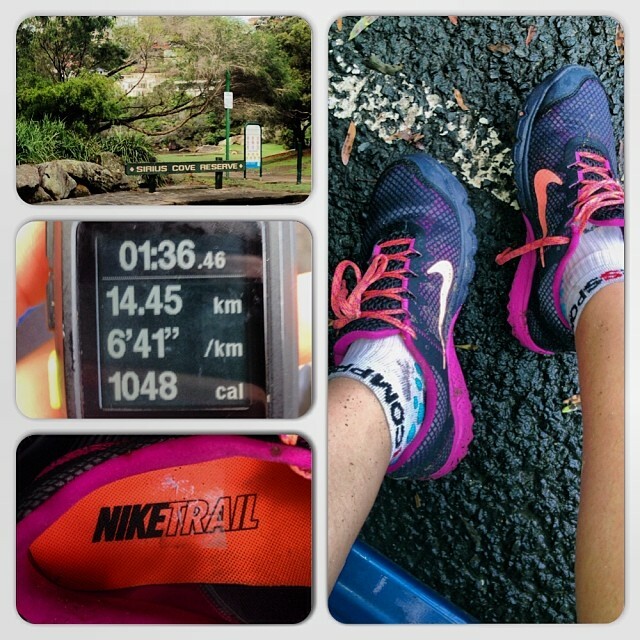 This entry was posted in Training Runs and tagged dirtrules, sydneystriders, trailrun, trailrunning by laurenhailey. Bookmark the permalink.